Have any of you ever set up your alarm clock to wake up in the morning? Of course, I am not asking you how many of you have been successful in waking up after alarm goes. I am just asking you how many of you set up your alarm clocks to wake up in the morning. Its quite amazing to see the different reactions of different individuals when the alarm goes. Some guys, when the alarm rings, they are so deep in their sleep practically in a state of slumber that everyone around them wakes up but these guys are fast asleep. In our monastery, we had one monk who had huge alarm clock with equally bigger or probably a bigger sound. And we had a rule in our monastery that no one would set up alarm before four in the morning and this guy would set up his alarm at half pass two in the morning and the alarm would keep ringing and he would never wakeup, most of our monks would be so dead tired that they wouldn’t ever bother, and they would just continue sleeping although disturbed. One day, one of our monks was so disturbed with the ringing alarm, he got up in a state of fury, picked up this large ringing alarm clock and went to the balcony, our monastery is on the second floor, and threw the alarm clock across our courtyard on the street just facing our monastery. The alarm clock hit the street, broke open into two pieces, yet continued ringing aloud. The whole neighborhood got up but the guy who set the alarm clock was still fast asleep in a state of slumber. I call these guys – the SLEEPERS. The second type are those, who when the alarm rings, they will say “Let me sleep for five minutes more”. 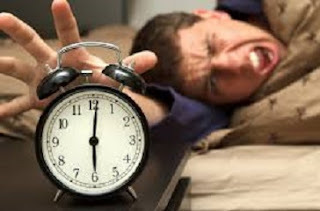 Those guys profusely express their gratitude to God for having inspired that gentleman who invented the snooze button. I am sure some of you are nodding. When people keep just snoozing five more minutes, another five minutes, but at least these guys at the fourth or the fifth snooze wakeup. And then conveniently they turn the alarm off and go back to sleep again. And then the fourth guys are those, who when they hear the alarm, the first ring, actually wake up, get out of bed and hit the floor to start with their day today activities. Which one of these four are you? I call them – the WAKERS. Who actually wake up as soon as the alarm rings. The alarm of spiritual wisdom is meant to awaken us internally, so that we can make proper choices. We can think right, do right and live right. And when this spiritual wisdom alarm clock rings, there are four types of reaction again. The first are the SLEEPERS. They keep hearing the alarm, but they are in such a state of deep slumber and ignorance that they don’t hear at all. Infact, they just continue with their old ways, they continue making wrong choices they don’t even bother about transforming themselves or the inner awakening. Type two are the SNOOZERS, those who when they hear the alarm clock, spiritual wisdom, they say, yes, we will change, we have to change. Not today though, tomorrow. Snooze, snooze, they keep postponing – the snoozers. The third type are the FALLERS. When spiritual wisdom and awakening comes to them, they actually wake up, they start changing, they start living right, and they start doing right. But then, for some reason they go back to their old ways, wrong ways, complacent ways, lethergic ways, not so right ways – the FALLERS. And the last types is the WAKERS. These are those people, who when spiritual wisdom is heard by them, they wake up. Awaken and start the process of transformation and change by the earliest. YES, ladies and gentlemen, all of us have to be wakers. We don’t want to be sleepers, snoozers or fallers, we want to be wakers. When the alarm of spiritual wisdom rings, let us all take that awakening very seriously.